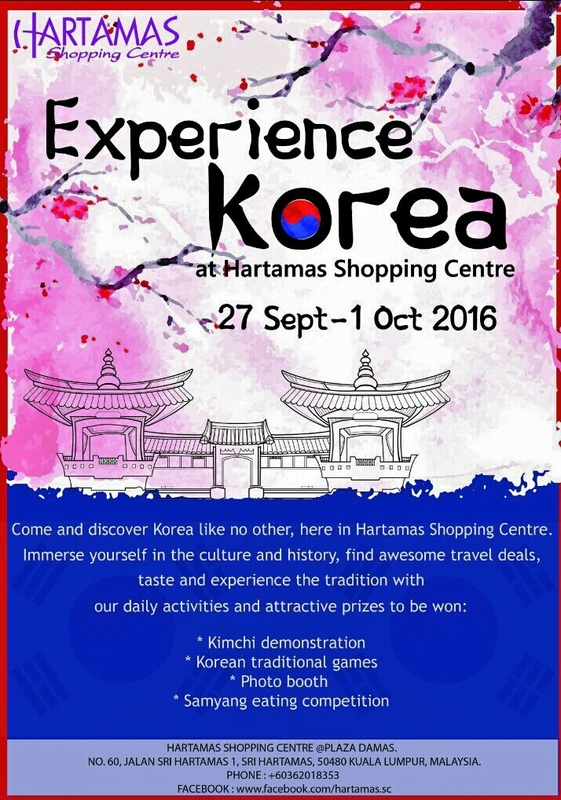 Hartamas, KL: Hartamas Shopping Centre, the neighbourhood mall of Hartamas and Mont Kiara area is inviting everyone to experience Korea from 27 September to 1 Oct 2016. The fair which is happening all around the mall is showcasing to visitors’ Korean product ie Korean food, fashion, lifestyle and more. There will also be showcase of Korean culture also happening at the Main Concourse daily from 1pm onwards. This Korean Fair is meant to share the culture, connect and experience with the visitor and shoppers of Hartamas Shopping Centre. “We would like to appreciate and celebrate the cultures of other nationalities especially among the residences around the mall vicinity as they are also our esteemed customers”, said Mr Alex Tan, the Centre Manager of Hartamas Shopping Centre. Hartamas area is not only the prime locations for the Malaysians, but also home for expatriates from many countries from around the world especially Koreans and Japanese. The daily activities chosen to be showcased during the 5 days fair are the traditional cultural dance at the opening, the Ddakji/ Korean kite demonstration on the second day, Tuho (Korean traditional throwing sticks game) on the third day, Kimchi demonstration on fourth day and Samyang eating competition on the last day of the fair with great Korean products to be won. Visitors and shoppers are all welcomed to join all the activities and enjoy the experiences that Hartamas Shopping Centre is offering at this exciting fair.